The weather will feel like summer this weekend, but Lake Erie is cooling down, with a water temperature of about 70 degrees. So what’s the fishing like? Lake Erie anglers are targeting walleye, yellow perch, smallmouth bass, and panfish, and inland lake/pond anglers are primarily pursuing largemouth bass, channel catfish and panfish, Cleveland Metroparks aquatic biologist Mike Durkalec writes in his weekly fishing report. Rock bass, largemouth bass, smallmouth bass, crappie, freshwater drum and sunfish species can be found along the Cleveland shoreline in summer and can be caught on offerings such as tube jigs, dropshot rigs and live bait. Some good eater size walleye (15-20 inches) have been found in water as shallow as 16-24 feet deep by Cleveland area boating anglers, although more consistent catches are being made in 68-70. Yellow perch fishing off Cleveland has been heating up off Wildwood Park in 32-38 foot of water. Steelhead Expo, Rocky River Nature Center: A collaboration between the Ohio Central Basin Steelheaders and Cleveland Metroparks offers expert speakers and seminars, vendors, and other related information to kick off the fall steelhead season. The event is free, but you’re encouraged to enter the raffle fundraiser. More information on the Steelheaders web site. Rocky River Watershed Council Fundraiser, Slim & Chubby’s: The Rocky River Watershed Council is having a fundraiser at Slim & Cubby’s in Strongsville (12494 Prospect Road) from 5 to 8 p.m. The $35 charge includes unlimited appetizers and drinks, plus a silent auction and raffle all to benefit watershed protection efforts! RSVP at www.myrockyriver.org. Walk-ins are welcome. Where: Fishing has been fair with the best reports coming from Cedar Point, Huron, and Vermilion in 25 to 45 feet of water. Anglers are reporting limits of 17 to 22-inch fish. Fish are being caught less than 1 mile offshore east of Kelleys Island as well. How: Anglers trolling small spoons behind divers have been doing the best, from 45 to 80 feet back depending on where the fish are in the water column. Orange and purple have been working well. Fish have been caught trolling crankbaits and stick baits with increasing success. Anglers have also reported doing well on worm harnesses behind bottom bouncers or divers. Where: Fishing for yellow perch has been fair due to the inconsistent weather patterns. Prior to this past week’s storm the best reports came from south of Green Island in 25 to 30 feet of water, and near the Camp Perry “D” can. Look for the fishing in these areas to pick up after the weather stabilizes. Where: Fishing for largemouth bass continues to be good for anglers in the Portage River mouth, East and West Harbors, and Sandusky Bay. Smallmouth fishing has been fair. How: Texas rigged soft plastics and spinnerbaits have been producing well for largemouth bass on the outside of weed edges. Where: Anglers targeting catfish are doing extremely well in Sandusky and Maumee bays. Shoreline fishing opportunities are available from the Jackson Street Pier, Shoreline Park, Battery Park, or Meigs Street Pier in Sandusky, and the Sandusky Bay Bridge access. How: Shrimp is a popular bait in Sandusky and Maumee bays, though fish have also taken on shiners, nightcrawlers, and stink bait. Most anglers fish a Carolina rig or three-way rig. Fish can also be taken below a bobber suspended just off the bottom. Where: Good fishing reported in 65 feet of water northeast of Wildwood Park. Excellent fishing continues with limits reported in 69 to 73 feet of water north of Geneva, and in 70 to 72 feet of water north of Ashtabula. Fish are suspended, and anglers are targeting fishing depths of 40 to 60 feet while trolling. How: Walleye have been caught by trolling crankbaits, spoons, and worm harnesses with divers. Good colors to try are silver, green, orange, black, white and silver, and copper. Anglers fishing from shore are having the best luck in the evenings catching fish using spinners and stick baits. Where: Prior to the storms this past week, fishing had been good in 44 feet of water north-northwest of Fairport Harbor, and in 60 feet of water north of Conneaut. 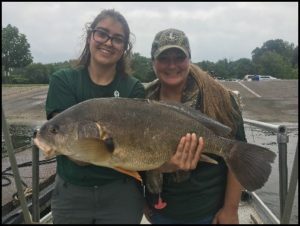 Where: Fishing has been good in 15 to 22 feet of water around harbor areas in Cleveland, Fairport Harbor, Ashtabula and Conneaut. How: Anglers are using drop shot rigs with crayfish and leeches, small spoons, and night crawlers. Where: Fishing for channel catfish has been good on the Grand River, Fairport Pier, and Painesville Township Park Pier. How: Anglers are using live baits such as night crawlers, leeches and shrimp. Where: Anglers are picking up steelhead while trolling for walleye off Geneva and Ashtabula in 69 to 73 feet of water. How: Try setting your lures down a bit deeper than for walleye. The Lake Erie water temperature is 70 off Toledo and 70 off Cleveland according to the nearshore marine forecast.